17 August starting a round 19.00 – Representation of traditional Cretan wedding with music and dance groups of Kissamos. Rizitika by the Association of Rizites “Kissamos”. Procession through the streets including mounted men and the ‘bride’ in traditional dress, ending near the sports stadium by the sea. Presentation of the program by the folklorist, G. Skouloudis. Music by G. Motakis and his band. Cretan bands throughout Kissamos, particularly on Skalidi, by the cafe’s in Tzanakaki Square (Aeras etc) . 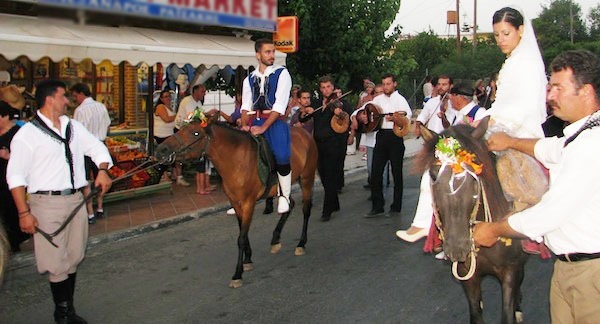 Participation of Association of friends of traditional West Cretan Horse “Georgalidiko”.